It’s tempting to say that Broderick Bagert’s announcement he’ll no longer be heading up Together Baton Rouge, the local oblast of the Chicago-based Industrial Areas Foundation which has been in the news so often lately due to its Great Patriotic War against the city’s largest private employer ExxonMobil, is an outgrowth of what’s beginning to look like overreach and public-relations failure. Particularly given the news earlier this week that First United Methodist Church, one of the key congregations Together Baton Rouge recruited in order to give itself a Potemkin village of interracial and interideological support, is pulling out of the organization. When Sharon Weston Broome, the mayor-president of Baton Rouge and a virtual puppet of Together Baton Rouge from even before she ran for her current position, had to hold a pep rally Monday in order to attempt to show how appreciative the city is for ExxonMobil’s presence here and how frightened its leadership is that ExxonMobil might be serious about declining future capital investments in its petrochemical facilities in Baton Rouge, which the company signaled last week following the East Baton Rouge School Board’s vote vetoing a pair of ExxonMobil’s ITEP applications, it was a pretty good indication Together Baton Rouge had put itself in something of a public-relations gulag. Bagert’s organization had a decent run of luck over the past two or three years, but it looks like that might be over. And now Bagert is out – or more to the point he’s being kicked upstairs by the politburo in Chicago. 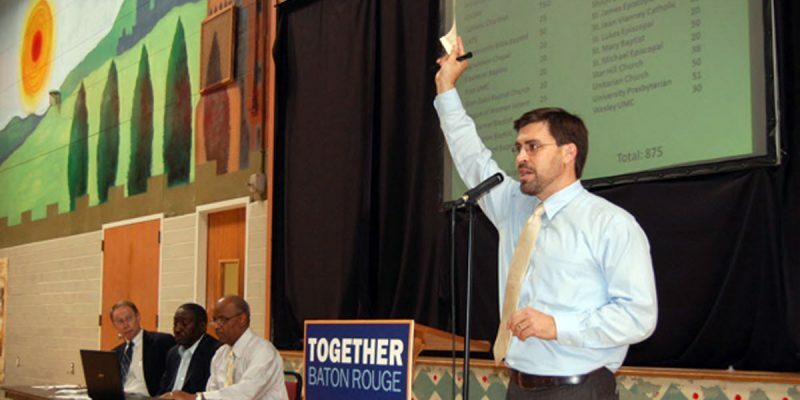 The longtime lead organizer of Together Baton Rouge, Broderick Bagert, is no longer at the helm of the local and often controversial left-leaning group he helped grow over the past decade. He has been replaced by Perry Perkins, who took over from Bagert earlier this month. The leadership change comes as TBR and its sister organization, Together Louisiana, have come under fire for its criticism of the state’s Industrial Tax Exemption Program and, more specifically, opposition to ExxonMobil’s requests for tax breaks for investments made in 2017. Bagert, however, says the shakeup has nothing to do with the controversy over ITEP. Rather, he says, he requested the move more than a year ago in a meeting with Perkins, a longtime community organizer with the Chicago-based Industrial Areas Foundation—with which TBR is affiliated—and who first brought the IAF to Baton Rouge in 2008 at the invitation of several local black pastors. We’d love to say this is just one more lie among hundreds Bagert has told since parachuting into Baton Rouge, but based on the history of how the Industrial Areas Foundation operates it appears that his version is true. There’s a reason why having short periods of duration for local IAF commissars is the usual practice, and it’s because it’s an organization devoted to destroying the fabric of the communities it imposes itself on – and if there is a name and a face associated with that process things can go badly, and that name and face starts to become poisonous. So it was always the plan that Bagert would fade into the woodwork and someone else would have to take over so as to rebrand Together Baton Rouge. It just looks more necessary now given the reversals of late. Perry Perkins is the Supervisory Organizer for the southern region of the Industrial Areas Foundation, the nation’s oldest and largest network of organizers and training institute for institutional organizing. He serves on the National Strategic Team and is Co-Chair of the Staff Transition Process. Perkins also serves as Lead Organizer for Together Louisiana, the coalition of IAF-affiliated organizations in Louisiana. For nearly four decades, Perkins has been involved in the development of local non-profits committed to crossing the divisions of race, religion and economic status, helping to found six non-profits dedicated to community development. Prior to his 30-year engagement with IAF, Perkins served as Executive Director of the Southern Columbia Heights Tenants Union in Washington DC. He also served as Lead Organizer for the United Woodcutters Association in Mississippi, Allied Communities of Texas in Fort Worth, the Jeremiah Group in New Orleans, Northern and Central Louisiana Interfaith, the Greater Baton Rouge Sponsoring Committee and Working Together Jackson in Mississippi. He also served as Senior Organizer for The Metropolitan Organization in Houston. Perkins’ writings have been published in Sojourners, Democratic Faith and the Project of Lived Theology at the University of Virginia. His article “Organizing as a Spiritual Discipline” was presented as a part of the Project on Lived Theology’s public lecture series. He frequently speaks and teaches at colleges, universities and congregations. A graduate Greenwood High School in Greenwood, Mississippi, Perkins received his B.A. from Mississippi College with majors in History, Political Science and Philosophy. He is married to Patricia Millsaps Perkins; they have three daughters and one granddaughter. Now you can roll your eyes. The “hyperpartisanship” he’s talking about is, from a practical standpoint, really the resistance by a community to the kind of leftist agitation that the IAF does. And it’s a very good bet that as Perkins becomes the face and brand of Together Baton Rouge that’s going to be their message – that “moneyed interests” have created a “hyperpartisan” atmosphere which prevents unity and progress in East Baton Rouge Parish. When what’s true is the opposite, and Together Baton Rouge has been the primary driver of the current belligerence in town. They’ve managed to reverse the city’s reputation as a business-friendly jurisdiction, something which persisted during the 12 years Democrat Kip Holden was mayor-president, they’ve taken triumph in having mobilized a majority of voters to pass dedicated taxes to fund wholly corrupt local agencies in the Capital Area Transportation System and the East Baton Rouge Council on Aging, and they’ve managed to wake up the business community politically in ways which weren’t possible to imagine four years ago – in the last few months we’ve heard from lots of Baton Rouge business owners who can’t be considered particularly politically conservative, if they’re politically active at all, but have now become terrified that these people are turning Baton Rouge into Jackson. And now Together Baton Rouge has a new commissar whose playbook was literally written in Jackson. So it’s every bit as bad as it seems. Not that we’ll miss Broderick Bagert. We won’t have the opportunity. He’s still going to be around anyway, working in other cities in Louisiana to cause the same trouble he’s caused here. The IAF doesn’t let up, and it doesn’t give reprieves to the communities it seeks to drag behind its iron curtain. It was all part of the plan, as he says.